This guest post was written by Anastasia Quintana. Anastasia is a 2nd-year PhD student at Duke (please don’t stop reading) who used to study marine parasite ecology at UCSB with Armand Kuris. Now she has switched fully into the social sciences, and studies with advisor Xavier Basurto how communities organize to manage their environmental resources. She is enthusiastic about people, coffee, basketball, and UNC, among a myriad of other things, and can be found in her Pilkey office on Piver’s Island at the Duke University Marine Lab. Let me tell you a story. I went to undergrad at University of California Santa Barbara (UCSB), which is on the beach. “On the beach” is not a figurative term (below). It’s a fun place – there’s consistently decent surf and vibrant student life. Figure 1, Left: view from my lab. Right: view from the balcony of my house. Photos by Anastasia Quintana. 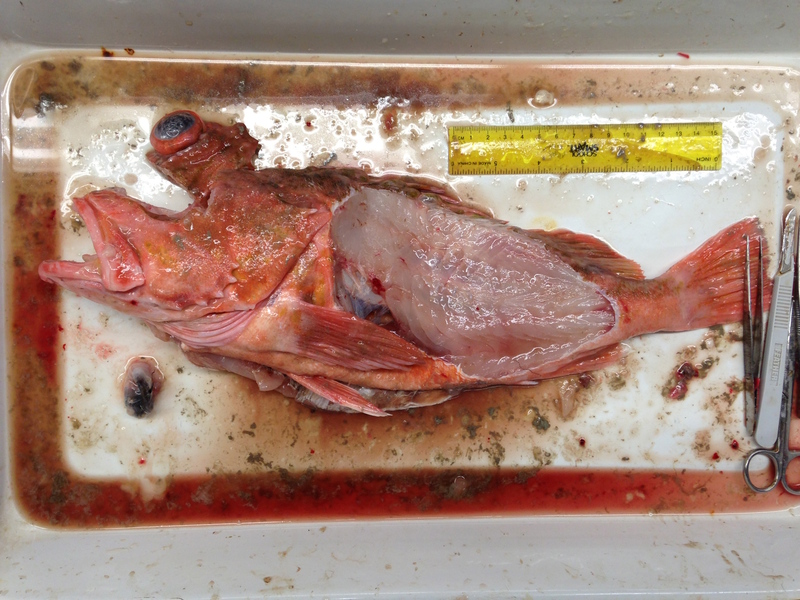 Figure 2: Calico rockfish, dissected for parasites. Photo by Anastasia Quintana. “Why would you ever spend time looking at Figure 2 when you could be looking at Figure 1,” you may be wondering. And if Google’s estimate of your perception of the world is at all accurate, then the word ‘parasite’ probably conjures up awful images of grotesque worms and debilitating medical parasites – something like this. Figure 3: Google Image search for “parasite”. In short, most of us think of parasites as horrible and gross things which, frankly, the world would be better off without. And in the case of many medical parasites – that is true! There are really, truly awful human parasites which many medical programs are making serious efforts to eradicate. I’ve had my run of parasites, and I can tell you: for the ones I had, being a host was not fun. But: parasites are fascinating, and they are important to the planet. Our very human medical experiences with parasites give the entire consumer strategy a bad name. We systematically understudy parasites – for this reason (they are gross and evil) and other reasons, too (they are small, they are inside things that are usually cuter than they are, they hide well, and they are hard to see). If you are an ecologist or biologist, the fact that they are understudied, alone, should be dinging bells for you! Systematically understudied things are low-hanging fruit for developing and testing theory. But if you’re not an ecologist or biologist, you will still find parasites fascinating – after all, I promised. There are many, many reasons why they are fascinating (and I encourage you to go out and find these reasons – both on the Internet and in your own investigations) but to me, these are the big 5 reasons that you should be thinking more about parasites. 1) Parasitism is the most popular lifestyle on earth (a phrase given to me by UNC’s own Joe Morton). Yep. When you think of a place teeming with life, you might imagine coral reefs or tropical rainforest. But, this is only part of the picture: when you envision these ecosystems, there’s lots of evidence that you’re missing 50% of what’s really there! New evidence suggests that parasites make up AT LEAST 40% of animal species on the planet, and due to the aforementioned systematic-understudying problem, it’s likely that they make up more like 60% of animal species (Klaus 2005). Figure 4: What I see when I look off my balcony at UCSB. Collage by Anastasia Quintana. 2) Parasites are ecosystem indicators. Many parasites have these crazy complex life cycles; they don’t just have one host, or even one type of host. Many parasites are first parasites of something, and then by some process (often being eaten) they become a parasite of another species. 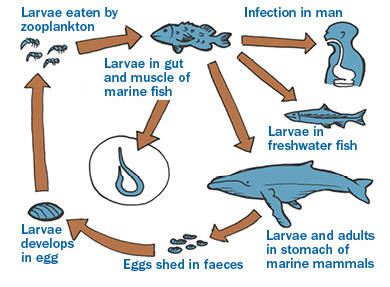 For example, a nematode might first be a parasite of a zooplankton which is eaten by a fish and then a whale. The nematode needs all three (zooplankton, fish, and whale) to reproduce and progress through its different life stages. Ergo, if you find this nematode in a zooplankton, you know there are whales – and it can be much easier to find zooplankton than whales. Figure 5: Example of a nematode life cycle. Photo courtesy of http://www.fish.wa.gov.au/PublishingImages/Maps%20and%20graphs/fish_health_03.jpg. 3) Parasites are important in explaining ecological patterns. They can control host populations in crazy ways, and are often as important as major predators like sharks – they’re just a bit less visible than sharks. They can have impressive top-down effects on entire ecosystems; ask Joe Morton about it – he’s doing his dissertation on this. 4) Parasites have intimately coevolved with their hosts. Contrary to how it might feel if you are ever a parasite host, they are (often) not trying to kill their final hosts – at least not right away. Most of the time, the worst thing that can happen to a parasite is to have its final host die. Many parasites are extremely species-specific, and so species loss as we generally think of it might really be happening twice as fast – since when we lose the megafauna we think about, we are also losing their intimately coevolved parasite species. 5) And lastly, they are real-world body snatchers. This is just cool (when the host is not a human or your pet dog): parasites do some crazy things to their hosts. A worm living in a cricket can make the cricket make suicidal journeys to find water. A fungus in an ant can drive the ant to climb to its death at the top of a tall blade of grass. The trematode below makes its snail host substantially more visible to bird predators. 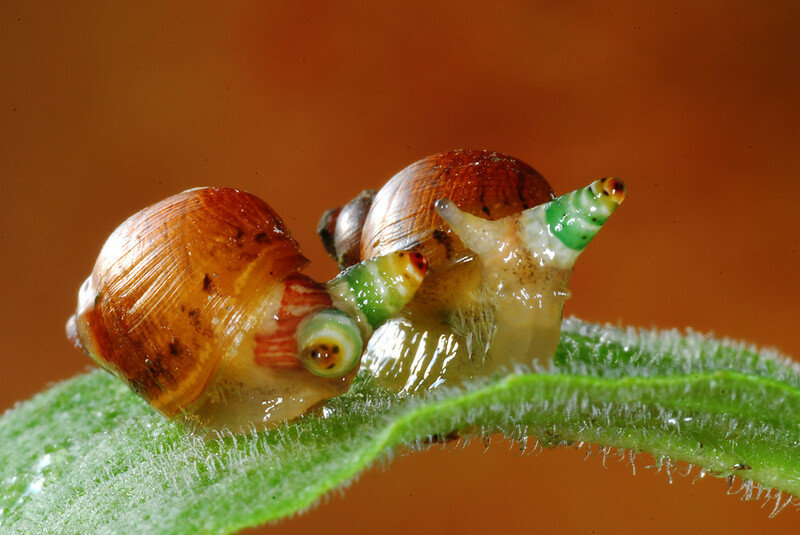 Figure 6: Leucochloridium paradoxum trematode parasites inside of these snails’ eyes. Photo courtesy of https://c2.staticflickr.com/6/5056/5484226446_1ce86d3efc_b.jpg. In sum: parasites are fascinating. They are everywhere, they are diverse, they are often holding the puppet strings, and they tell us things about our world. And so: you should be thinking more about them. Rohde, Klaus, ed. Marine parasitology. Csiro Publishing, 2005. 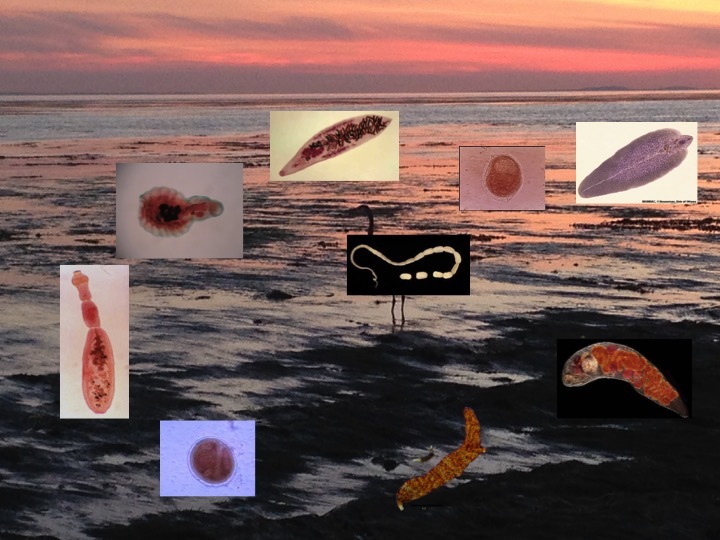 Tags: Ecology, Guest Post, Marine Science, parasites, parasitism, research. Bookmark the permalink. Hmm interesting. Are all parasites interested in the doom of their host? Or do some live in harmony, or even benefit their host? By definition for a parasite, it’s the doom option. Some interesting/friendly things can happen for other players in the game, but for the actual host: not good news.